2 queen size beds and a twin. 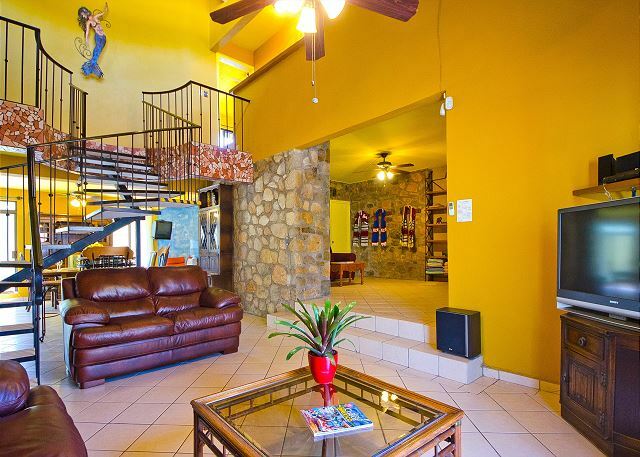 Just three blocks to the Cabo San Lucas marina, two blocks from Medano Beach, and two blocks from down town San Lucas, this Casa is the perfect place for those who do not want to drive during their vacation. The Casa has 3200 square feet of living space with all three bedrooms located upstairs and each having a private bathroom, terrace, and air conditioning. Amenities include a fully equipped kitchen, dining table with seating for 10 guests, 2 spacious sitting rooms, family room, satellite television, Free Wifi, free international calling, and a private swimming pool. In the evenings you can light the built in fireplace, one of the chimneys, or turn on the garden lights to set you own ambiance.